Established in 1995, Hitachi Home Electronics Asia (S) Pte Ltd is the marketing arm of Hitachi Ltd. Their Consumer Division provides extensive sales distribution and marketing services for consumer electronics and multi-media products across Asia Pacific West and South Asia, and some regions in Africa. The superheated steam microwave oven does healthy meals with Superheated Steam which reduces calories, fats and salt. It has 5 cooking methods - microwave, steam, grill, superheated steam and oven - to optimize cooking according to food type. Its best feature, the 36 Auto Menu function, employs a combination of five heating methods to give the best results. 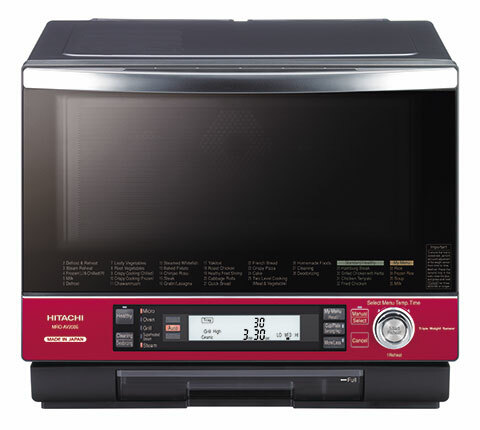 On top of that the uniquely Hitachi Triple Weight Sensor can sense the food’s position and effectively focus microwaves onto the food. It automatically weighs the food and adjusts the optimum temperature and cooking time required. Even when adding two more meat patties to the current batch in the microwave oven, it will recalculate the time and temperature based on the new weight.